1 week down, $3800 more to go! It’s been a really awesome week for our Kickstarter project. It’s the 7th day since we launched and with 33 backers we’re nearing 40% funded!! If you want to get involved, go over to our page, check out our video and donate! We are giving away rewards ranging from and advanced copy of the album to signed CDs, records, and guitars, to hanging out with the band for a night. Click here and become a part of the album. The new album cover! 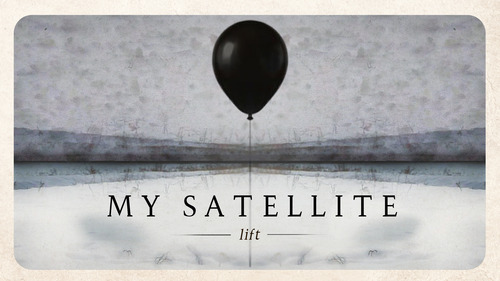 Check out our Kickstarter at https://www.kickstarter.com/projects/816298171/my-satellite-the-new-studio-album-lift for info on how you can get involved. We’ve just launched our Kickstarter to help us complete our new full length album, Lift. Check out the video to get your first look at the cover art for Lift and a little taste of the new music that you can expect to hear from us. We’re really excited to share this with you all. Now is your chance to get involved with the creation of something that we have put our heart and souls into for the past seven months. We are offering some really great rewards for your help in successfully funding this project. Click below to get over to Kickstarter and check out the video!!!! Hello friends. We have some very exciting news to announce. After spending the better part of this year writing, producing, recording, rewriting, re-recording, re-producing (but not reproducing) we are finally done with our debut full-length album. The new record is a ten song LP called Lift and we are immensely proud of what we’ve been able to accomplish with this. We cannot wait for it to hit your ears. It’s hopeful. It’s sad. It’s joyous. It’s introspective. It’s artistic. It’s beautiful. It’s been a labor of love for us and the effort and attention to every detail has make for a great sounding and moving album. We hope it moves you too. Oh, remember when we said that it was done? Well, we kinda lied. We’ve finished recording all ten songs so the longest and most time consuming part of the process is done. Luckily we were able to record for free in an awesome studio, borrow a ton of really great equipment, bring in other musicians to accompany us on some tracks, and we’ve exploited the generosity of our friends and families like the good little DIY band we are. But this next step is going to require some outside help. We need to get Lift mixed, mastered and all pretty and dressed up for the big bad world. This requires more investment than our limited budget can afford. In order to get the album completed in the way that we know it needs to be done we’ve decided to start a crowdsourcing campaign. This will be a great way for you guys to get involved. You can support us and what we do in any way you can, large or small, and we are going to offer you guys some really cool rewards for your help in getting Lift off the ground. Our Kickstarter campaign will be launching next week and we’re going to start rewarding you right from the beginning. Within the campaign video you will get an exclusive sneak peak at the album art and a taste of the music that you can expect on the album. Hopefully you will be able to break away from cat videos long enough to check it out. Once the campaign is done we will set a release date for the album and work on finishing up Lift. Benjamin in the studio hating life. Oh hai! It’s @kotaradical helping us out with sweet sounds on the new album! Mostly staring at legs at this time of night.